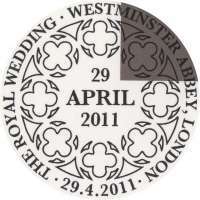 To celebrate the Wedding of HRH Prince William of Wales and Catherine Middleton on 29 April 2011. Royal Mail's issued a miniature sheet to celebrate the wedding of Prince William of Wales to Miss Catherine Middleton on 29 April. As with the issue for his father's second wedding, the stamps will be issued in a miniature sheet of 2 x 1st class and 2 x airmail rate, in this case £1.10. This is a very unusual limited edition. It comprises a large cardboard stand up balcony scene photo plus a poster portrait of Prince William and Catherine at their wedding plus the mini celebration stamp sheet which is hand stamped with the wedding date postmark both on the edge of the sheet and the centre of the sheet. Each sheet contain the limited edition number. The back of the cover features Westminster Abbey plus the technical details relating to the document. The cover is in a grey sepia whilst all other photographs are in full colour. 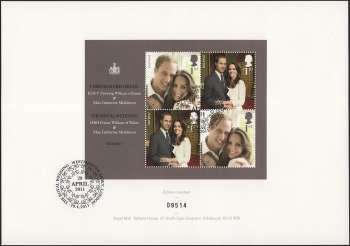 A Commemorative Document featuring images from the Wedding Day itself, priced at £9.99 was available from Royal Mail after 29 April 2011.